Yay! We made it into The Urban Lists’ feature on glamping, entitled Everywhere You Can Go Glamping In Victoria. Leave the mozzies, dodgy communal shower blocks and lumpy sleeping bags behind people, because we’re going glamping! We’re totally on board for toasted marshmallows, the fluffiest of bed linens and long hot showers, please. Get out of town this summer and take camping to glamorous new heights this weekend, no matter your destination. A glamping trip the Mornington Peninsula will reward you with farm fresh eats, coastlines as far as the eye can see and so much local wine. 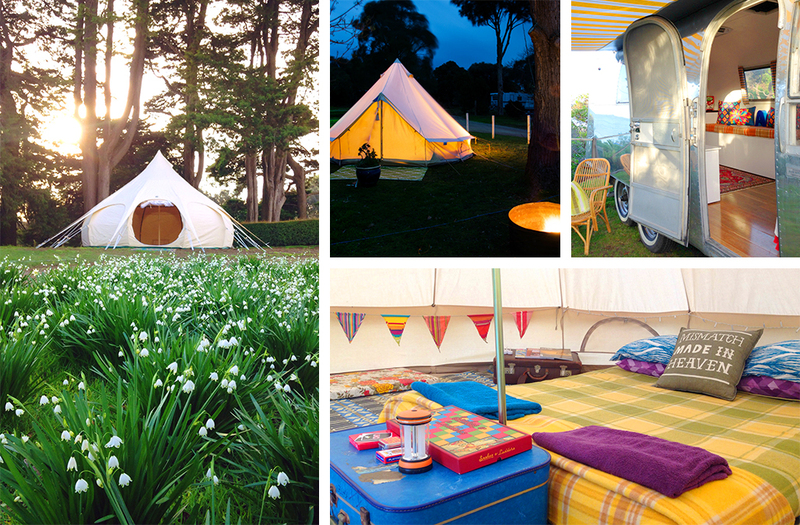 You could stay in one of their tents, but we’ve fallen in love with something a little bigger on offer from Happy Glampers. May we introduce you to “Peggy Sue”, a shiny silver vintage Airstream as well as “Miss Myrtle” a charming circa 1955 caravan? They’ll be towed to wherever you are, already filled with all of the comforts of home. There’s no set-up for cooking inside, but plenty of equipment for fixing up coffee, tea and the tasty snacks. A selection of books, mags and board games keep fun times going after dark before you settle into your queen-sized bed.